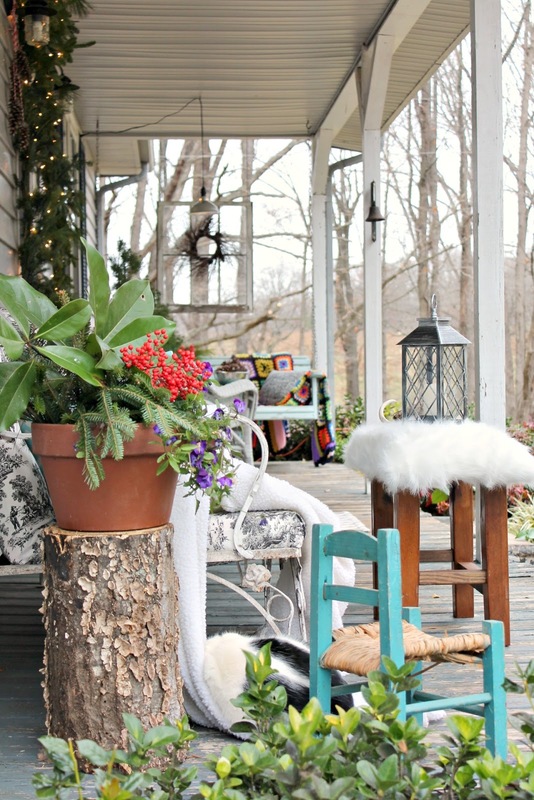 I kept the porch as simple as possible so that it would easily transition to a winter-time porch as well. My husband made the little fur covered bench for me and it doubles as a little table by the sofa. I recovered the sofa cushions with some recycled toile curtains that used to call the living room home and made a few more pillows in some grays and icy blues. 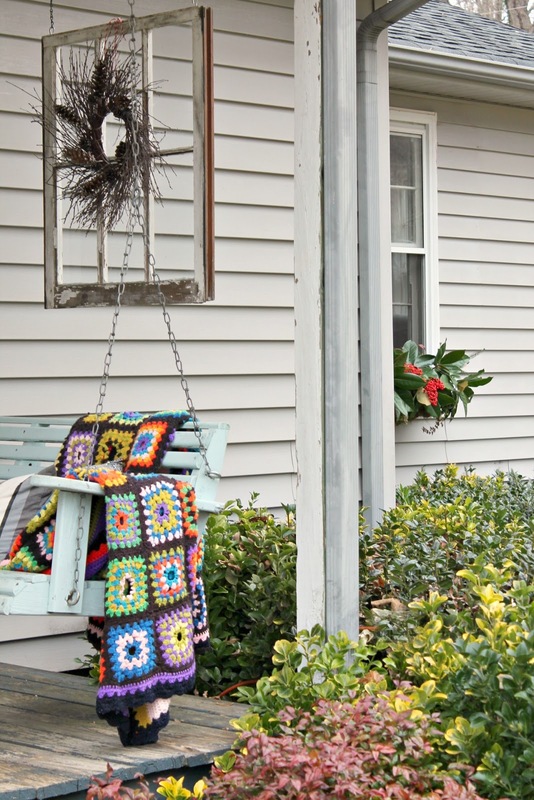 On the other side of the porch, I have another little sitting area with our swing and my favorite old afghan. I've had that blanket for years and I just love all it's bright happy colors. 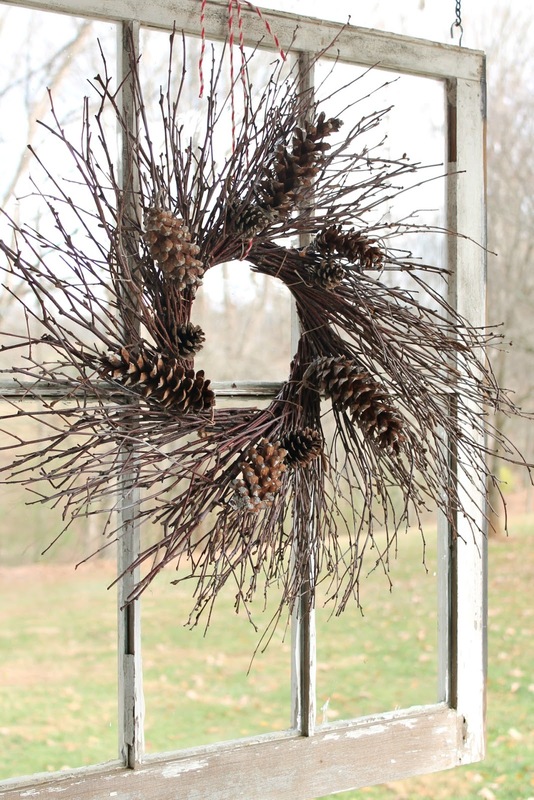 I added pine cones to a twig wreath that I use in lots of seasons. And here's some pictures from our little side porch that gets the most traffic at our house. We're totally back door kind of people y'all! 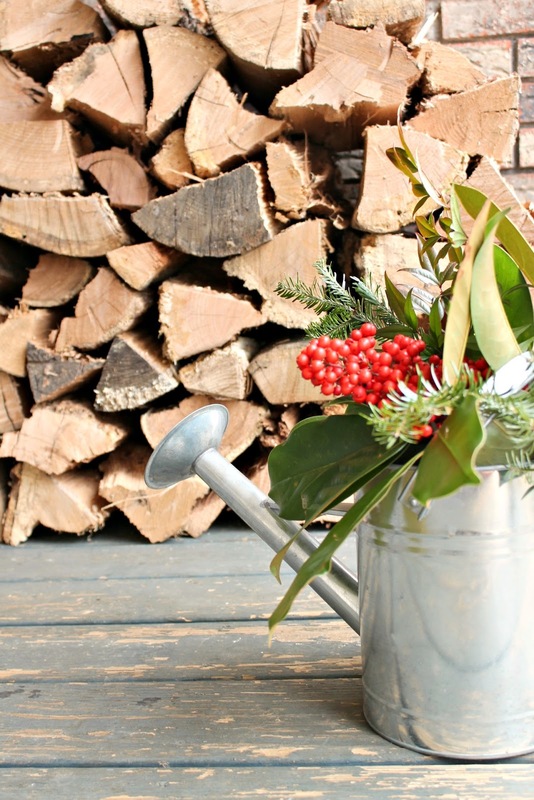 I was determined to stay simple and uncluttered this season using as many natural elements as possible. I thank y'all so much for coming by today for a little tour of our Christmas porches. Have a very Merry Christmas! 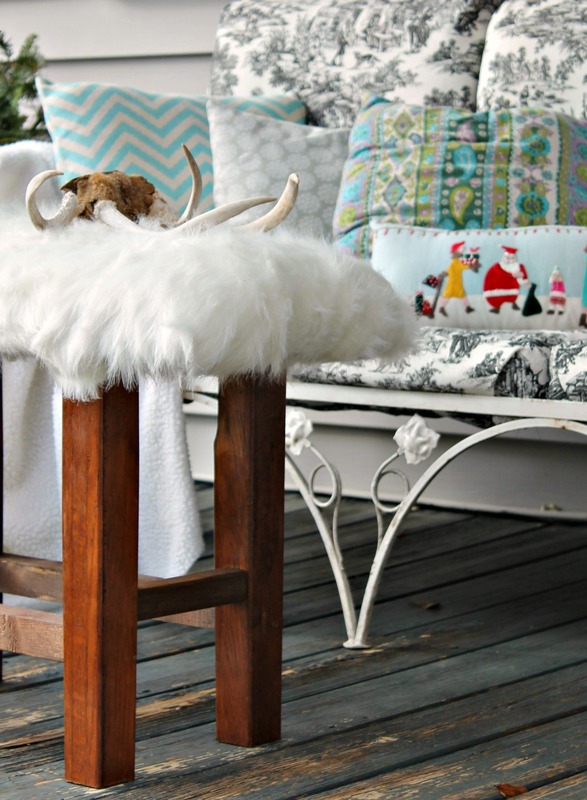 What a darling porch! I just wish I could snuggle up and stay a while. Found you through FMFG's link-up. So fun...what a natural/homey/unforced style you have. Thanks for sharing, and Merry Christmas! How sweet of you to stop by Ashley! Thanks so much for your kind words! Merry Christmas! Oh my gosh, looks like it can be in a magazine! 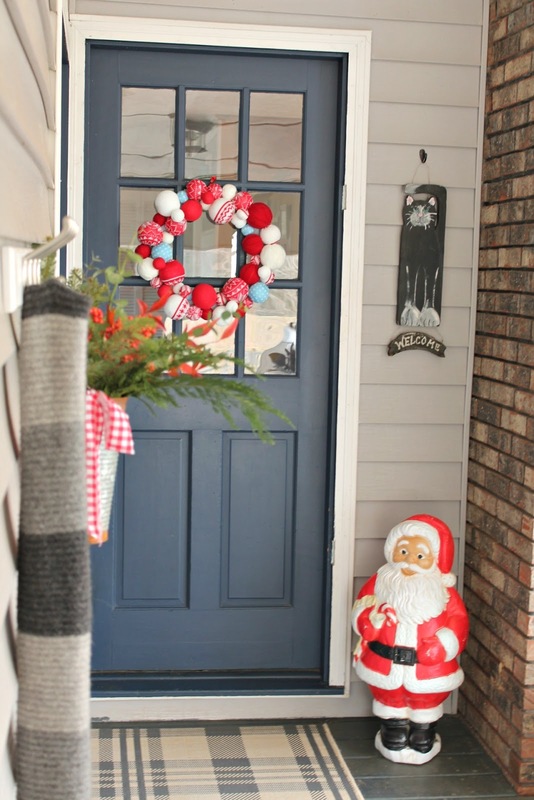 Great job and I love the wreath on the side porch. Thanks you Jennifer for taking the time to visit and for such sweet words. Hope your weekend is blessing filled! 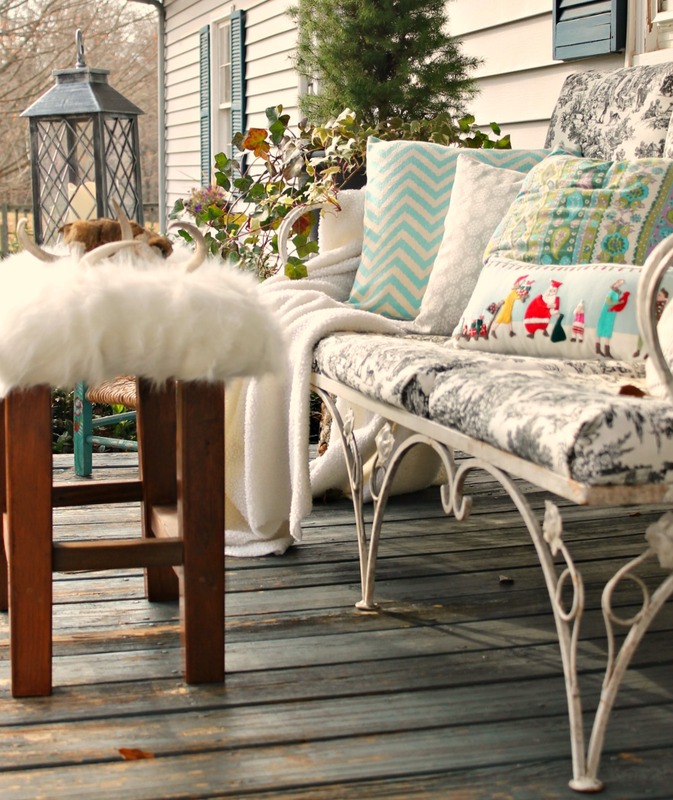 Your porch is an expression of love and warmth. Oh how I love to see your ideas! what a great space, and great pics. 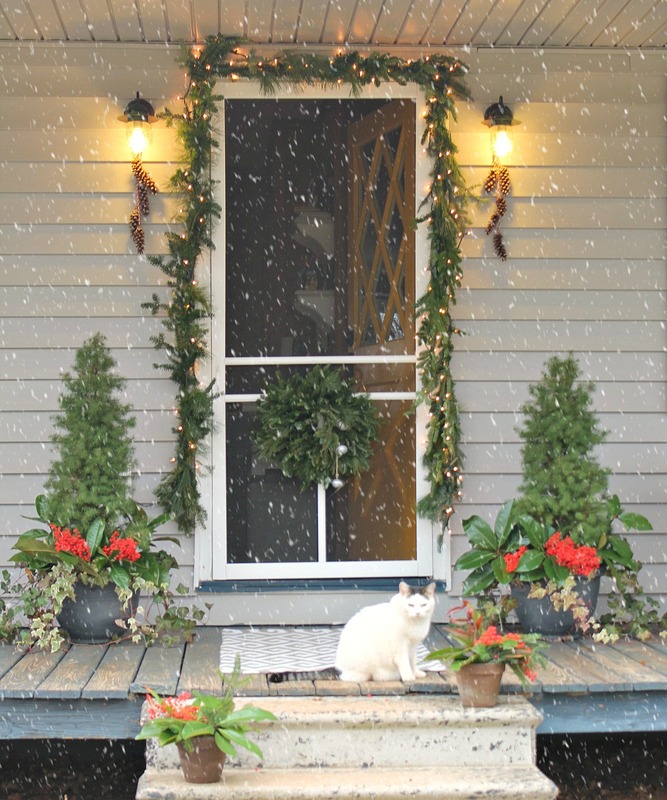 especially the one with the snow and the kitty. I would love to sit here and have my morning coffee, so beautiful! You just come on by sometime Christy! Thanks so much for visiting! Thank you so much Susan for visiting this morning and for the invite! I totally agree with you- a front porch is a must-have, especially when you have a small hose like ours. It becomes a great outdoor room. SOo pretty! I love that first picture with the now falling. :) All the greenery is gorgeous!! My porch got forgotten this year with all the inside decorating! OOps. :) Great inspiration! Thanks so much for visiting Amanda and for your kind words! You are so my HERO! Hugs Shannan! 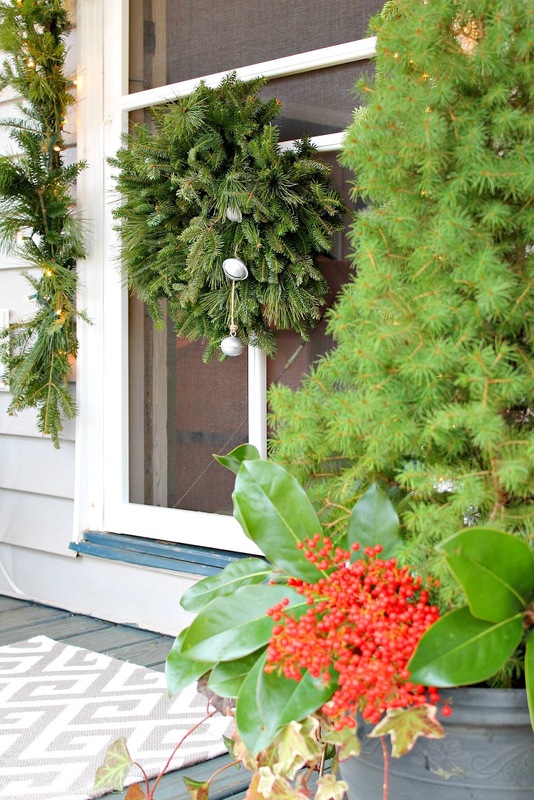 Love your porch style and the inside Christmas tour! It's real life... Not just a perfect show room to behold but not live in. When I saw your style I wondered if Shannon had ever seen your blog or vice versa. They seem a perfect style fit! Anyhow, pleased to see her comment. Just love her blog, Flower patch Farmgirl. I have adored her for years and Shannan's been such a HUGE inspiration to me! Thank you so much for visiting and for you sweet comment. Have a merry and blessed Christmas! I'm totally in love with this! Pinned and tweeted. We appreciate you being a part of our party, and I hope to see you on Monday at 7 pm. We love partying with you!